Pasta alla Norma, a traditional Sicilian dish found on just about every menu in Sicily, is a hearty pasta that is easy to fall in love with. It combines the perfect balance of eggplant, tomato sauce, and cheese to create a satisfying vegetarian meal. The version below is from Mario Batali, and I think it is perfect. Bring 6 quarts of water to a boil in a large pot, and add 2 tablespoons salt. Cook penne 1 minute less than the package instructions and drain. Meanwhile, heat a large saute pan with a few tablespoons of olive oil. Add the onions and season with salt. Saute for a few minutes until tender. Stir in the eggplant and allow to cook for 3 minutes without moving. Stir the mixture and then add the cooked noodles and some basic tomato sauce just to coat the noodles. Add freshly torn basil leaves, grated pecorino and a few drizzles of olive oil and toss to combine. In a medium bowl whisk together the fresh ricotta with a few tablespoons of pasta water to loosen. 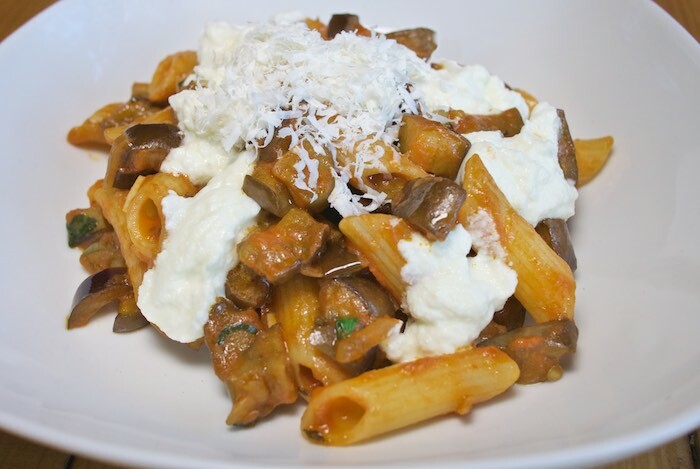 Serve the pasta with large dollops of the fresh ricotta and freshly grated ricotta salata. now this needs to be on my table tonight! Meals like this are pure comfort for me!! Love it! I've been thinking about this recipe... We love eggplant, and this looks absolutely wonderful!